We began this morning, as we do each morning, with time in the Word and in prayer preparing for what we will be seeing and doing in our travels that day. Here at the Tabgha Pilgerhaus we have a fantastic view over the beautiful Sea of Galilee! Our first stop of the day was the Church of the Beatitudes which is the traditional location for Jesus' Sermon on the Mount. It's octagonal design reflects each of the eight beatitudes Jesus described. After visiting the church we found a shady spot to read the Beatitudes and reflect together on the upside-down values of the Kingdom that challenge our worldly assumptions about the "good life." Just down the hill from there we visited the Church of the Multiplication of Loaves and Fishes, which is a beautiful reconstruction of a fifth century Byzantine church built on the traditional location where Jesus performed the miracle of the feeding of the five thousand. Part of the amazing mosaics that covered the floor of this church included the famous "Tabgha Mosaic" which depicts the five loaves and two fish of the miracle. They are placed just in front of the ancient stone which was remembered as the table where Jesus blessed and broke the bread. At each of the churches we visit we cross paths with other Christian pilgrims from all around the world who are seeking Jesus and expressing their faith according to their own culture. Lighting candles as a symbol of prayer is one of the traditions I have come to appreciate. Even more moving than visiting ancient churches is gathering to worship as the church of today. We were blessed to gather at the lovely lakeside chapel in Tabgha where we reflected on the meaning of this miracle for us today and then joined in sharing Communion together as a group. Once again God met us in a powerful way and fed our souls with new insights and growing faith. It is such a blessing to share this spiritual journey with these wonderful brothers and sisters from Australia and across the US. We all agree we are quickly becoming an extended spiritual family! Today we began our exploration of the area where Jesus decided to establish a center for his Galilean ministry. We are staying at the beautifully restored Tabgha Pilgerhaus, a guesthouse for pilgrims situated on a secluded beach on the Sea of Galilee near the traditional location where Jesus fed the 5000. After breakfast we headed to Capernaum, the nearby first-century fishing village where Jesus centered his ministry in Galilee. After visiting the large synagogue built on the foundations of the synagogue where Jesus taught and healed, we took a close look at the houses in Capernaum from Jesus' time. We can see that people did not live in single-family dwellings the way most of us do, nor did they function primarily as a nuclear family. Instead they understood family to be multiple generations of blood and non-blood relations comprising an extended family that shared life and work together. In the New Testament this is called an "oikos." Their houses were built to accommodate multiple nuclear families in rooms surrounding a common courtyard. We were amazed to discover that the actual extended family home of Simon and Andrew has been discovered here and the remains are preserved underneath the modern church. This is where Jesus made his home and built a new kind of spiritual family, a family on mission! From Capernaum we took a boat trip on the lake to get a clearer picture of this beautiful setting and the various places around the lake where Jesus carried out his mission. We also got a demonstration of fishing with a casting net, much the way Jesus' disciples used to fish! With one cast he caught a small Tilapia! Getting off the boat we then visited the museum built to house an amazing archaeological find: a 2,000 year-old fishing boat excavated from the mud at the bottom of the lake! It took decades to restore this one-of-a-kind discovery so that it can be displayed, but it was worth the wait. This 27 foot-long boat is from the time of Jesus and is exactly the kind of boat Jesus and the disciples used as they traveled around the lake. As is our custom, we had a lovely picnic lunch on the veranda of our guesthouse overlooking the lake. Everyone pitches in to help lay out the feast. However, once we were enjoying our lunch we discovered the policy at this guesthouse is not to bring in outside food---ooops! Today we packed our bags and departed the Holy City, heading north to Galilee. We drove through the Jordan Rift Valley, following the ancient pilgrim route along the course of the Jordan River. Driving up the beautiful and strategically important Jezreel Valley we came to Nazareth, perched on the northern ridge of the valley. Modern Nazareth is a large Palestinian city, but in the time of Jesus it was a small and somewhat insignificant village. We visited the modern Church of the Annunciation, which is built over and preserves the ruins of three previous churches, a Jewish Christian Synagogue, and a first-century home which has consistently been identified as the boyhood home of Jesus. Unlike many other traditional sites related to the early years of Jesus, this site has a high degree of probability to be historically accurate. Outside the Church we visited the ancient remains of the first-century village and were literally looking at the place where Jesus grew up! We visited "Nazareth Village," an archaeologically accurate reconstruction of village life from the time of Jesus. There we learned about various aspects of daily life that would have shaped Jesus' boyhood in this place. One of the goats from their herd had just given birth to a new kid only minutes before we arrived! This Mamma Goat Just Gave Birth to a New Kid! We enjoyed demonstrations of the kinds of work that went on in the village of Nazareth at the time of Jesus, including carpentry and weaving. 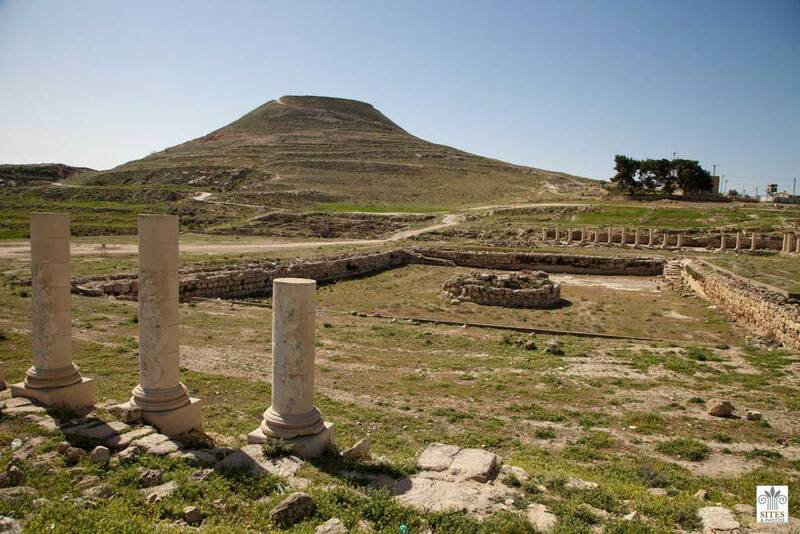 Jesus' family were builders ("teknon") and would have had a thriving business as Herod Antipas was enthusiastically expanding his nearby capital city of Sepphoris. We concluded our big day with a visit to the huge archaeological excavation at Sepphoris. This was a booming cosmopolitan city made up primarily of Jews who had adopted many aspects of Roman culture. This is where the teenage Jesus would have come on a daily basis with his father and brothers to make a living building the many stone structures that earned this city the nickname "The Ornament of All Galilee." Today we marked the beginning of Jesus' public ministry by visiting the traditional site of his baptism by John in the Jordan River. For most of the 30 years I have been coming to the Holy Land the Jordan River was totally inaccessible in the region where Jesus was baptized because it is the border between Jordan and the West Bank. Recently both the Jordanians and the Israelis have developed facilities for pilgrims at this spot and have opened it up so now we can visit it. One of the most powerful experiences of the trip so far was the privilege of renewing our Baptismal Covenant with God in the very place that the heavens were torn open, the Spirit was poured out, and the Father said, "This is my beloved Son and in him I am well pleased." After our moving and refreshing time in the Jordan River reflecting on the baptism of Jesus, we headed, like he did, into the unforgiving Judean desert wilderness. Wadi Kelt has the only spring for many miles around, so we can say with some certainty that this was the vicinity where Jesus fasted for forty days and sparred with the devil. We took a hike down into this dramatic ravine to visit the ancient Saint George Monastery. Unlike most desert monasteries, Saint George's has been known since the sixth century for it's warm hospitality. The monks served us cold drinks and strong Turkish coffee as we wandered the ancient corridors and took in the beautiful views. On our hike back out of Wadi Kelt we were besieged as always with Bedouins offering us everything from a cold drink to a donkey ride up the trail! Back in our vans we headed to a nearby desert overlook where we made lunch and enjoyed it together with some young Bedouins while soaking in the amazing desert scenery. After lunch we had a moving time of worship and reflected on Jesus' forty days of fasting and testing in the wilderness. For many of us our concept of "wilderness" was radically altered by the seemingly endless barren ridges and valleys stretching for untold miles in every direction. To top off the day we headed back down to New Testament Jericho and explored the excavated ruins of Herod the Great's Winter Palace situated on the mouth of Wadi Kelt as it opens up just west of Jericho. It was a chance to see an archaeological dig in process and get another glimpse into the opulence and self-indulgence of this self-appointed King of the Jews. It was fascinating to realize that Jesus and the disciples would have passed right by this huge palace every time they "went up to Jerusalem." Today we began the journey of actually following Jesus' footsteps by visiting the place of his birth in Bethlehem and the angelic announcement to nearby shepherds. Although we don't have any archaeological evidence to locate the site of Jesus' birth, as early as the third century early Christian pilgrims reference a cave in Bethlehem where he was born. Today the fifth century Church of the Nativity built by Emperor Justinian to replace the Constantinian church that was destroyed in the Samaritan Revolt, stands over that cave. Unfortunately the ancient Church of the Nativity is undergoing major roof renovations so we couldn't see much inside. I wasn't too disappointed because I prefer the aesthetics of the next door Church of St. Catherine, even if it doesn't boast the same historical pedigree. The two side by side churches can be a contrast in religiosity vs. living faith. After visiting the churches we took some time to read Luke's account of Jesus' birth and reflect on the astounding fact that God became real to us by emptying himself and taking on the form of a servant. When you see the place and ponder the circumstances of Jesus' birth it is a powerful reminder that God chooses to work through the humble and submitted, not those who enjoy earthly glory or exercise temporal power. I guess that means if I want God to work through my life I am called to be more humble and submitted to him! We wound our way out of Bethlehem on a maze of criss-crossed streets heading for the Christian Palestinian village of Bet Sahour, the traditional location of the Shepherd's Fields. As we worshiped in the midst of the ruins of a Byzantine monastery, we glorified God and pondered the connection between the shepherd boy David, his 23rd Psalm, and the shepherds who first heard the good news of Jesus' birth. It was a beautiful moment when Malcolm paused in his teaching to point out the shepherd boy with his flock of sheep on the hill in front of us! As we sat in Herod's banquet hall which the Zealots converted into a synagogue we read the account of Herod's slaughter of the innocents in nearby Bethlehem. We couldn't help but contrast Herod's understanding of authority and exercise of power with Jesus of Nazareth. In the end all Herod's glory crumbled and disappeared under dirt and rubble, whereas the movement Jesus started has grown and multiplied for twenty centuries! Today we continued our exploration of the world in which Jesus lived and carried out his mission. We headed east and south from Jerusalem into the deep Jordan Rift Valley, dropping some 1400 feet below sea level. Here at the lowest place on earth, the Dead Sea has no outlet resulting in a salinity 10 times as salty as the ocean. 31 miles long and 11 miles wide it is a lesson in deception as its sparkling waters offer no refreshment for the parched traveler! Our first stop was at the ruins of Qumran along the Dead Sea. This is where three Bedouin shepherds in 1947 made the most incredible find of ancient manuscripts in history, the famous Dead Sea Scrolls. The nearby settlement is where members of the Essene sect lived and produced this amazing library of biblical and non-biblical works. We explored the ruins, reflected on their believe that ritual purity would prepare the way for the Messiah, and contrasted them with John the Baptist who called for repentance as preparation for the Messiah. From Qumran we headed further south along the western shore of the Dead Sea to the imposing fortress of Masada. First fortified by the Hasomonean rulers of Israel, Herod the Great expanded both the military might and the opulent luxury of this unparalleled fortress-palace. For Herod this was the place of last refuge for him and his family. During the First Jewish Revolt of AD 66-73 the Zealots fled to Masada for their final standoff with the Roman army. Surrounded by General Titus' 10th Legion they watched as the Roman's meticulously built their camps and siege wall surrounding the fortress. Constructing an impossibly massive ramp to the top of the mountain the unstoppable Roman army then breached the wall of what was thought to be an impenetrable stronghold. On our way down from Madada we were enjoying our much-deserved ice cream bars when this beautiful desert antelope made his appearance! From there we head back north to En Gedi, the site of one of David's desert strongholds while he was fleeing from Saul. There we carefully slid into the oily waters of the Dead Sea to enjoy the odd sensation of floating like a cork! Today we began with quiet time for Scripture reading and prayer journaling, followed by another fantastic breakfast buffet. We ate enthusiastically, fortifying ourselves for the challenge of walking the streets of the Old City and climbing the Mount of Olives. The combination of great fresh food and lots of exercises makes The Footsteps of Jesus Experience double as a membership at the gym! Another Delicious Breakfast to Start the Day! Then we headed out for an overview of Jerusalem and some reflection on the world in which Jesus lived, particularly the temporal and religious leaders of his time. Overlooking the remains of the massive Temple Mount which Herod dramatically expanded, we considered how different the authority and power of Herod, the Pharisees, and the Sadducees was compared to Jesus' authority and power. We headed out of the city walls through the aptly named Dung Gate and walked around the southeast end of the Temple Mount, dropping into the dramatic Kidron Valley. Passing by the mis-named Tombs of the Prophets we noted that Jesus and the disciples would have passed these monuments as well on their walk from the Upper Room to the Garden of Gethsemane. Crossing the Kidron Valley we began to make our way up the western slope of the Mount of Olives, passing by the Garden of Gethsemane. As we made the arduous climb the city of Jerusalem began to spread out before us. Sitting under some fir trees in the courtyard of the ancient Dominus Flevit Church we contemplated the Temple Mount, built over the peak of Mount Moriah, also called Mount Zion. As we worshiped and read the account of Abraham bringing his only son here to sacrifice him we couldn't help but consider how the God who offered oneness to Abraham in Covenant also offered his son on a nearby rock called Golgotha. With a clearer picture of the religious leaders of Jesus' time we look forward to our continued exploration of the world of Jesus tomorrow! As the members of our group of pilgrims were either getting settled in or en route to the Old City of Jerusalem, Pam and I set our with our dear friends Malcolm and Cheryl Potts to explore the Judean hill country south of Jerusalem. Our first challenge of the day was a malfunctioning security code in the rental car which set us back about 45 minutes, but once that was sorted out we headed to a small village in the Palestinian Territory south of Bethlehem to visit the so-called "Solomon's Pools." In the Holy Land anything old and impressive is usually attributed to Solomon at some point whether or not he had anything to do with it! In fact these massive pools were built by Herod the Great as part of his ingenious plan to supply water to the growing population of Jerusalem. Since there is only one spring to supply water in the Holy City, Herod's engineers built these water storage pools which were fed by local springs and then the water was directed to Jerusalem some 14 miles away via elaborate aqueducts spanning the hilly territory. After visiting the pools and exploring the aqueducts we enjoyed a classic Middle Eastern lunch in a huge, but empty shopping center built across from the pools, a sad testimony to the economic deprivation of the Palestinian Territories. From there we headed further south to the ancient town of Hebron, where Abraham and Sarah made their home by the Oaks of Mamre. It was here that Abraham purchesed a plot of land that included the Cave of Machpelah, his future burial site. Ultimately his wife Sarah and his grandson Jacob were buried there and possibly the other patriarchs and matriarchs such as Isaac, Rebecca, Leah and Joseph. In ancient times the Cave of Machpelah was revered as the tomb of the patriarchs and Herod the Great built a magnificent edifice of massive cut stones surrounding it. It is of special interest because it mimics nearly exactly the design of the massive retaining walls surround Herod's Temple Mount. Hebron is particularly tense these days because both the Muslims and the Jews lay claim to the Cave of Machpelah as a holy site. Over the centuries each community has laid claim to different parts of the enclosure and partitioned it off from the rest. The result is that the spacious, open air shrine that Herod built has become a compartmentalized maze of religious territorialism. Since it was Shabbat, the Jewish day of rest, we were not allowed to enter the Jewish side so only got to visit the Muslim side. While were visiting the mosque a young Muslim man told us the tragic story of a madman who killed 29 people there in 1994. From Hebron we drove north to Wadi Kelt, the deep ravine that runs from Jericho into the Judean dessert. It is the route follwed by the Roman road from Jerusalem and the setting for Jesus' parable of the Good Samaritan. There is an ancient spring there which Herod the Great utilized to bring water to his palace in Jericho. Since this is the area where Jesus spent forty days fasting in the desert and this spring is the only water source for many miles in every direction, it is almost certain that Jesus spent his time of temptation in the area of this spring and came here for water. We decided to drive down a very steep and deeply rutted road that drops into the wadi and discovered that it leads down near the spring! After a 15 minute hike I discovered this amazing little oasis in the midst of the harsh desert, a reminder of how the Father provides for us in our times of testing and temptation. A flock of sheep blocked my way on the return hike and I had to wade through my new wolly friends to get back to the car! That evening the final member of our group arrived and we enjoyed our first dinner together as we officially began our The Footsteps of Jesus Experience! After dinner we took an evening stroll down to the Western Wall and joined the various Jewish worshipers by praying at the massive stones of the ancient retaining wall of Herod's Temple Mount. The spiritual adventure has begun ... thanks for joining us! "Our feet are standing within your gates, O Jerusalem!" (Psalm 122:2) Pam and I arrived in our comfy room in the Old City safe and sound nearly 24 hours after leaving home at o'dark hundred! On the drive from the airport in Tel Aviv into Jerusalem we stoped to explore three possible sites for the ancient village of Emmaus. This is where the risen Jesus appeared to Cleopas and his extended family in the breaking of bread around their table on the evening of the first Easter. Since we have been teaching on that event this Easter season at Good Shepherd we decided it called for some more first-hand on-site research! After visiting the traditional Byzantine and Crusader sites, neither of which are historically convincing to me, we had fun exploring a little-known site with far more historical probability behind it. All this was made more fun by the inclusion of a young Orthodox Jewish woman named Lisa who sat next to us on the plane and accepted our invitation to accompany us on our mini-adventure! We enjoyed a delicious Middle-Eastern lunch with Lisa in the village of Abu Gosh before dropping her off at some friends' home in Jerusalem just in time for the celebration of Shabbat. It seems to be the new trend these past two years, but nearly all the members of our group decided to come one to three days early just to get settled in before the trip officially begins. Pam and I were delighted to meet some of the Australians who have come with our friends Malcolm and Cheryl Potts who are helping us lead the trip. Then the bulk of the American contingent arrived in time to enjoy a lovely dinner together at our good friend's excellent restaurant Versavee, just inside Jaffa Gate. After dinner some of us took an evening stroll down to the Western Wall. It was all quiet by the time we arrived, but just hours earlier the plaza was filled with Jewish worshipers celebrating the beginning of Shabbat. Our last day in the Holy Land started early as we began our walk on the Via Dolorosa at 5:30 AM to avoid the hustle and bustle of the Old City's crowded walking streets. We followed the traditional route first mapped out by Constantine's mother Helena in the fourth century, pausing at each of 14 Stations of the Cross along the way to reflect on Jesus' suffering for us. We concluded our observance of the Stations of the Cross inside the Church of the Holy Sepulcher which is built over an ancient rock quarry which had been converted into a cemetery by the time of Jesus. In that quarry there was a section of stone not suitable for building which was left uncut forming a large rocky outcropping. Standing just outside the city gate the Romans used this skull shaped rock as their place of crucifixion. Jesus was crucified here and buried in a nearby rock cut tomb. To actually touch the rock of Golgotha and peer into the tomb where Jesus rose from the dead is a powerful experience, in spite of all the religiosity and commercialization of the site. After breakfast and a shower we walked the more historically accurate route on which Jesus would have carried his cross and then visited the Church of the Holy Sepulcher, trying to make sense of the complex layers of history and devotion that makes this a place like none other. From the Holy Sepulcher we walked outside the city to a nearby park where Herod the Great's extended family tomb is located. It is the best example of a first century rolling stone tomb, precisely matching the description of Jesus' tomb in the Gospels. After inspecting the site we took some time on the grass in the shade of a nearby tree to worship, pray and reflect on the resurrection of Jesus and the remarkable experiences we have had together over these last two weeks in the footsteps of Jesus. It is clear that God has moved in everyone of our hearts in a way that will change the way we follow Jesus on the three continents we come from. Enjoying a time of worship celebrating the resurrection of Jesus! We had a great final dinner together at our good friend's fabulous restaurant, Versavee, located just inside Jaffa Gate at the Imperial Hotel. They completely renovated it last year and it is beautiful--not to mention the Arabic mixed grill they served us! A dessert of Baklava and Burma along with a selection of coffees finished off our final celebration. Now we are on our way home, thankful for all the great experiences we have shared together. When you have the opportunity to see, touch, and smell the places where Jesus carried out his ministry it brings a new level of awareness of the reality of our faith. The danger of a pilgrimage like this is to think that the experiences of God we have had are limited to these places. What is clear to us is that we are coming home to follow Jesus with greater faith and passion in the various places where God has called us to represent him and carry out his will on earth as it is in heaven. Thank you for joining us on this journey, for praying for us, and encouraging us. We look forward to sharing our experiences with you so that together we can bring the Good News of Jesus' Kingdom to the people God has called us to serve. PS: If you are interested in being part of a future Footsteps of Jesus Experience, please email Bob Rognlien at pastorbob@lcgs.net. As our spiritual pilgrimage in the footsteps of Jesus is quickly coming to a conclusion, we turned our attention to the final days of Jesus' ministry in Jerusalem. Because of the Jewish holiday of Sukkoth (Pentecost) we were unable to walk through Hezekiah's Tunnel and visit the newly discovered Pool of Siloam yesterday, so we visited the Upper Room and Garden of Gethsemane yesterday and did Hezekiah's Tunnel today. So we started out the day by visiting the southwest hill of ancient Jerusalem and reflecting on Jesus' arrest and trials. We went to the church which commemorates Peter's denial of Jesus at the House of Caiaphas. Although we don't know the exact location of the High Priest's house where Jesus was put on trial by the religious leaders, we do know it happened somewhere here on the upper hill in the southwest part of Jerusalem. Archaeologists have found a number of large and elaborate houses in this area that match the description of Caiaphas' house. Mike did some teaching on the denial and reinstatement of Peter by Jesus and helped us to see that ultimately our call is to be in Covenant with Jesus so that we can carry out the business of the Kingdom as part of God's extended family. Outside the church we were able to se a street from the time of Jesus which was like the street Jesus and the disciples would have taken to Gethsemane from the Upper Room and like the one the soldiers would have used when bringing the arrested Jesus back for trial by the religious authorities. Since it was closed the day before, we went from the upper city down to the City of David where we walked through the ancient tunnel system which King Hezekiah dug in order to bring the water of the Gihon Spring inside the walls of the city. This half mile long water tunnel is cut out of solid rock, barely wider than a man's shoulders, and empties into the ancient Pool of Siloam. Recently archaeologists have uncovered the stepped pool which was the place where Jesus sent the blind man to go and wash as part of his healing (John 9). It was incredible to sit on those steps and imagine how that man's life was transformed by Jesus' gracious and powerful act. We asked God to give us faith to exercise the authority we have received to do the same! Luke and Taylor emerging from Hezekiah's Tunnel! On our way back into the Old City we encountered crowds of religious Jews who were following up on the Sukkot holiday with celebratory Bar Mitzvah processions, complete with drums, dancing, and singing. We stopped at a street side restaurant for lunch and to watch the festivities. We spent the rest of the afternoon on our own exploring the Old City, shopping, and resting. We gathered again in the evening for our traditional Seder meal and communion service. It was a great way to finish off our remembrance of Jesus' supper with the disciples and our second to last dinner in Jerusalem. Today we reflected on the ministry Jesus carried out in the city of Jerusalem by visiting the pools of Bethesda where Jesus healed the paralytic as recorded in the fifth chapter of John's Gospel. For years critical scholars had questioned the historical accuracy of John's account which he described taking place by pools "surrounded by five porticoes," claiming no such architecture had ever been found. When archaeologists began excavating the ruins at this site, they not only found the five porticoes surrounded the pools of Bethesda, they also found a pagan healing shrine next to them, accounting for the crowds of people gathered there seeking healing. As we looked at the remains of the massive pools, the pagan healing shrine, and the subsequent layers of ruined churches, we were struck by the pattern we have seen here and elsewhere: Jesus seemed to regularly venture into areas that would have been considered questionable by the religious establishment in order to connect with People of Peace. It caused us to reflect on how insular our lives can be and how rarely we connect with people who are far from God. We also began to reflect on the final days Jesus spent with his disciples in Jerusalem, beginning with the final Passover meal he shared with them in an upper room of a large home in the southwest part of the city. We visited the site of the Upper Room which is built on the foundations of a first-century house where the very first public building for Christian worship was built in the second century after Christ. The weather turned uncharacteristically chilly and we got some sprinkles of rain, so it was nice to gather in the warm confines of this room where we sang "Spirit of the Living God" a midst the comings and goings of other pilgrims. From the southwest part of the city we made our way down into the Kidron Valley just as Jesus and the disciples did after dinner that night on their way to the Garden of Gethsemane. There was a large grove of olive trees on the lower slopes of the aptly named Mount of Olives and a particular area was named Gethsemane after the olive oil that was pressed there. There is still a small but ancient grove of olive trees there next to a large rock where tradition tells us Jesus poured out his heart to the Father in anguish over his impending suffering and death. Today a beautiful church sits on that site and mimics the feel of the olive grove at night. The purple colored windows and low lighting give the church an evening feeling even at mid-day. The domes in the ceilings are covered with the mosaics of a starry night sky. Mosaics of olive branches extend from the columns on which those domes rest, mimicking .the olive grove which once stood here. The large Rock of Agony makes up the base of the altar in the church. In spite of the construction that was being conducted inside, this is one of the most beautiful and moving churches we have visited. Outside near the grove of ancient olive trees we reflected on what it took for Jesus to submit himself to the Father's will even in the face of unspeakable suffering. Making our way back into the Old City we stopped near Damascus Gate to pick up delicious falafels and Arabic pastries for lunch back at the Lutheran Guesthouse. There was a small Palestinian demonstration starting outside the gate which escalated to stone throwing and a strong reaction from the Israeli police, but by that time we were long gone from the area. After lunch Mike did some teaching on Jesus' Last Supper with the disciples and then we spent the rest of the afternoon resting or shopping in the markets of the Old City. Our spiritual adventure is quickly moving toward its dramatic conclusion as we focus on Jesus' arrest, trials, crucifixion, and resurrection in these last two days. Please pray for us to finish strong! Today we retraced Jesus' triumphal entry into the capitol city of Jerusalem on Palm Sunday. As Jesus and the disciples approached Jerusalem on the Roman road from Jericho they came to Bethany, the village of Jesus' close friends Lazarus, Martha, and Mary. Jesus had arranged to pick up a donkey outside of Jerusalem so he could fulfill the prophecy of the Messiah entering the city over the Mount of Olives on a young donkey. As Jesus crested the Mount of Olives riding the donkey, the crowds of pilgrims heading up to Jerusalem began to shout out in the words of the psalmist, "Hosanna! Blessed is he who comes in the name of the Lord!" We visited the town of Bethany, which today is named after Lazarus and lies less than two miles east of Jerusalem on the other side of the Mount of Olives. However, the dividing wall which the Israeli government has built between the West Bank and Israel now separates Bethany from Jerusalem, so we had to drive many miles around the wall into order to get to nearby Bethany. After eating a delicious lunch there, we visited the traditional tomb of Lazarus and spent some time reflecting on Jesus' connection with the extended family of Lazarus, Martha, and Mary in this place. Mike Breen reminded us that Martha served Jesus and Mary listened to Jesus and we need learn from them how to do both. Next we went to the top of the Mount of Olives and took in the spectacular view of the city from there, imagining how the disciples and crowds must have felt finally seeing the magnificent Temple standing before them after their long pilgrimage to the Holy City. There we spent some time reflecting on how Jesus wept over this complex and divided city, foretelling its coming destruction at the hands of the Romans. Jerusalem, which means "City of Peace," continues to belie it's name as three religions wrestle with one another and a violent struggle between Palestinians and Israelis continues to divide this land. Recognizing Jesus as our true King of the one Kingdom that lasts forever is the only way to find lasting peace in this constantly divided world. When Jesus entered the city on Palm Sunday he and the disciples immediately visited the massive Temple Mount, the dominant architectural feature of this unique city. We had the opportunity to visit the extensive archaeological excavations surrounding the southern end of the massive platform that Herod the Great built to expand and glorify the Temple. First we watched a special presentation on the first century Temple Mount, using an amazing computer animated reconstruction of the Temple Mount put together by a team from UCLA. Then we got to actually walk through the massive excavations, walking on the first century streets and steps that Jesus and the disciples walked on as they went up to the Temple! Mark tells us that as the disciples were exiting the Temple Mount they pointed out the massive stones and buildings to Jesus and we totally understood their amazement. We also saw the effects of the Roman destruction of the Temple complex in AD 70, fulfilling Jesus' prophetic reply to the awestruck disciples when he told them "Not one stone will be left upon another." In the evening Pam, Luke, Taylor and I had the opportunity to meet our long-time friends the Katanasho family for dinner at Versavee, the elegant restaurant which their relatives own and run here in the Old City (4.5 stars on TripAdvisor). It was so wonderful to catch up with my dear friend Yousef who I have known for 27 years here in Jerusalem. It was also fascinating to watch how they function naturally as part of an extended family who share a common sense of vocation. The restaurant is run by Gabi, the brother of Yousef's wife Rula, but the entire extended family help run it, even if they have other jobs. Yousef's brother Tony is married to Rula's sister and he is the cook. Rula's sister and brother help wait the tables. Yousef's and Tony's sons and daughter help out in the restaurant after school, learning from their aunts and uncles. It was a modern living example of what we have been learning about the way Jesus functioned with his disciples as an extended family on mission together. We are praying that we can learn how to build spiritual extended families who share together our Father's family business, the mission of the Kingdom. Today we focused on the rhythm Jesus established of moving from times of deep abiding to times of great fruitfulness. In addition to retreat areas around the Sea of Galilee such as Tabgha, occasionally Jesus took the disciples away from the area to rest, disengage from the crowds, and open themselves to new levels of revelation. Caesarea Philippi, in the far north of Israel is one of those places Jesus took his disciples. There he asked them, "Who do you say that I am?" The head waters of the Jordan River flow from the spring of Banias. This is the place where the headwaters of the Jordan River originate in the gorgeous spring that flows from the cave of Pam at Banias. After visiting the remains of the huge pagan worship site there, we sat on a circle of ancient stones to reflect on Mike's teaching about what it meant for Simon to take on a new name and receive the authority to represent Jesus. After our visit to the spring and a time of reflection, we headed to the nearby Banias Waterfalls, which is more likely to be the actual area where Jesus and the disciples would have spent their time. This gorgeous waterfall is unlike anything else in this part of the world and rewards all those who hike down to it with a cool and refreshing experience. As much as we would have liked to spend all day in this beautiful spot, we headed south, setting our faces toward Jerusalem. Since it closed early on the day we were scheduled to visit Sepphoris, the large cosmopolitan city near to the village of Nazareth, we decided to stop in on our way back to the Holy City. We walked the ancient streets of the city, admired the gorgeous mosaics, and got a real sense of the kind of building that was Jesus' family business. We spent another day in Galilee enjoying the fantastic beauty of this place and exploring more historical and holy sites. We started the day off by visiting the Yigal Alon Museum where the ancient Galilean Boat is housed. This 30 foot long fishing boat dates to precisely the time of Jesus and is the type of boat Jesus and the disciples used. Two members of a local Kibbutz stumbled across this one of a kind discovery and after a decade of special treatments it was finally ready to be displayed as we see it today. Standing around the boat we could imagine Jesus and the disciples out on the lake while he calmed the storm, walked on the water, told them to let down their nets on the other side, and asked Peter to let him speak to the crowds from his boat. We walked straight from seeing this ancient boat and boarded a modern boat to take our own trip on the lake. We had a great time sailing on the calm waters of Galilee and seeing some of the sights we have visit from a different perspective. We also received a demonstration of net casting and were led in a rousing Israeli folk dance by our enthusiastic captain who is the seventh generation of an extended family of Galilean fishermen. Disembarking we made our way up the hill to Chorazin, a prominent first-century city prominent first-century city where Jesus taught and ministered regularly. we visited the ancient synagogue there and a walked the streets on which Jesus and the disciples would have walked. We also visited the huge extended family home located next to the synagogue. This house included an extraordinarily large central courtyard surrounded by fourteen different rooms which would have housed nearly that many nuclear families. There Mike Breen taught on the meaning of Jesus' promise that in our Father's "house" (oikos) there are many rooms and he is going to prepare a place for us. He explained how Jesus' redefinition of the extended family on mission became the primary vehicle by which the disciples of Jesus multiplied and changed the world. We marveled that God would choose to make us members of his extended family and that we get to enjoy all the benefits of belonging to his oilkos both now and forever! From Chorazin we headed east and visited Bethsaida, the hometown of Peter, Andrew, and Philip where Jesus also taught and healed. We saw another fisherman's extended family home and got a clearer picture of the setting in which the followers of Jesus learned how to function as an extended family on mission for God's Kingdom. From there the rest of the group went back to relax at our guesthouse on the lake while Luke and I returned to the cliffs of Arbel to climb down into the ancient caves where Herod the Great fought to establish his cruel rule over the people to whom Jesus ministered. Today we began our exploration of the area where Jesus chose to focus nearly his entire ministry: the north end of the Sea of Galilee. This so-called "sea" is really a gorgeous fresh-water lake some 14 miles long and 5 miles wide surrounded by fertile hills and dramatic cliffs. When you come here from the barren heat of the desert or the constant hustle of Jerusalem, it is not hard to see why Jesus would choose this place to center his mission. Our first stop for the day was in the ancient lakeside city of Capernaum where Jesus called Peter, Andrew, James and John to follow him. Archaeologists have discovered evidence identifying the actual house of Peter and Andrew where Jesus cured Peter's mother in law and healed the paralytic who was lowered through the roof. When we read words in the Bible like "house" and "family" we automatically think of the nuclear family. In the biblical context these words are actually describing an extended family made up of a number of nuclear families, multiple generations, and people of non-blood relationships as well. We looked into the extended family house where Jesus made his home and pondered the words he spoke when his mother and siblings tried to come and take him back home to Nazareth: "Those who do the will of God are my mother, and sisters, and brothers." We all agreed that learning to develop this kind of a missional extended family is a key component of being a disciple of Jesus and learning to live the kind of life that he lived. After we left Capernaum we headed to Tabgha, a lush beach with seven natural springs where Jesus is believed to have fed five thousand people with five loaves and two fish. In addition to visiting the reconstructed Byzantine church with the famous fish and loaves mosaic commemorating the miracle, we also gathered at an idyllic open air chapel on the edge of the lake for a Communion service. There Mike Breen taught on the power of God which is released when we offer up the broken pieces of our lives and place ourselves in his hands. After a delicious falafel and ice cream bar lunch in the world's smallest restaurant we headed up the hill above Tabgha to the beautiful site of the Church of the Beatitudes overlooking the lake. There we reflected on the upside down values of the Kingdom of Jesus demonstrated and proclaimed, asking God to shape us by these same, non-worldly values. At that point we split into two groups with one going back to our lakeside guesthouse to swim and rest while six of us drove to the otherside of the lake and explored the extensive ruins of Hippos (Susita), one of the cities of the Decapolis from the time of Jesus. The massive public buildings and grand paved boulevards, point to the wealth and grandeur of these pagan cites at the time of Jesus. Since this area was contested territory between Israel and Syria, the slopes surrounding Hippos were laced with mines, so we stayed to the path as John Lovell demonstrates in the picture below! John Lovell explains why it is a good idea to stay on the path! We finished the day with another great dinner on the veranda of the Peniel Guesthouse over looking what has to be one of the most beautiful lakes in the world ... we are truly blessed to be walking in the footsteps of Jesus! After four days of exploring the world into which Jesus was born and the beginning of his ministry, we left the singularly unique cacophony that is the Old City of Jerusalem and headed north to Galilee, the territory where he spent nearly all his life and carried out the vast majority of his ministry. Driving north through Jericho and into the Jordan Valley we saw the massive agricultural production that modern irrigation has made possible in this desert climate. We stopped along the way to buy some freshly picked watermelons for lunch at a roadside stand ... Pam drives a hard bargain over here! Two hours later we were plowing our way through bumper to bumper traffic in Nazareth, today the largest Palestinian city in Galilee, though at the time of Jesus it was just a small village. Our first stop was the massive Basilica of the Annunciation built over the ruins of earlier churches dating all the way back to an early Jewish-Christian synagogue which in turn was built over the foundations of the house where Jesus grew up. Because Jesus' relatives continued to live in Nazareth for over 200 years after his death we have a very high certainty that this is the actual boyhood house of Jesus. The modern church has been built in such a way as to both preserve and display the ancient remains. From the church we went to the nearby Nazareth Village, an archaeologically accurate reconstruction of a first-century Galilean village. It was amazing to see the farming techniques, the layout of their extended family homes, to sit in the kind of synagogue Jesus preached in, and to picture the life Jesus and his family lived in Nazareth. Next we drove to the top of the Mount of Precepice, traditional site where the residents of Nazareth responded to Jesus' first sermon there by trying to throw him off the cliff. We had another great picnic lunch while we enjoyed a panoramic view of the Jezreel Valley which Nazareth overlooks from the north. We sat in the shade of a grove of pine trees while Mike Breen led us to reflect on the extended family of origin who rejected Jesus and led him to call together a different kind of family in a new place. Members of The Order of Mission welcome our newest Temporary Member, Art Barrett! Now we are settled into our new accommodations at the Peniel Guesthouse on the northwest shore of the Sea of Galilee and can't wait to see what God has in store for us tomorrow as we begin to explore the places where he preached, healed, and demonstrated what life looks like when we are living in the Kingdom of God! Today we focused on the two defining events which mark the beginning of Jesus' public ministry: his baptism in the Jordan River and his forty days of testing in the nearby Judean desert wilderness. We started off the day with a visit to Qasr El-Yahud, the traditional site of Jesus' baptism in the Jordan river across from Bethany beyond the Jordan. This site has been closed to us for decades since Israel and Jordan have technically been "at war," but in light of the 1994 peace treaty, the Israeli government finally opened up the site and it is beautiful. We are excited that Mike Breen has joined us for the rest of our journey to teach the Covenant and Kingdom aspects of what we are experiencing. Standing on the edge of the Jordan, Mike shared insights about the baptism of Jesus, pointing out that the Father's words over Jesus are the basis of our own identity as the children of God. With that powerful Gospel declaration ringing in our ears we went down to the waters of the Jordan and a number of our group renewed their Baptismal covenant where Jesus was baptized. Our son Luke and his girlfriend Taylor renewed their baptisms, which was especially moving for me and Pam! After joyful laughter, some tears, and lots of toweling off, we left this peaceful spot and headed into the oldest continuously inhabited town in the world, Jericho. We went off the road to find the nearly hidden ruins of Herod the Great's winter palace, which straddled the outflow of Wadi Kelt, one of the countless desert canyons that open up onto the Jordan Valley. Then we headed up into the desert wilderness where Jesus spent the six weeks following his baptism fasting and preparing for the spiritual battle ahead of him. Hiking down into Wadi Kelt brought us to the ancient monastery of St. George, inhabited by Greek Orthodox monks and renowned for its hospitality. Some of us went off the beaten path and hiked through the rugged dry creek bed of the Wadi in search of the spring that feeds the two Herodian aqueducts build to bring water to his Jericho Palace. Another delicious lunch enjoyed in a spectacular setting! Today we moved from focusing on the world of Jesus to the beginning of his life. We passed through the concrete wall erected by the Israeli's between Israel and the Palestinian territories and plunged into the chaos that is modern Bethlehem. Once we got past the street merchants and taxi drivers trying to get some kind of business out of us, we made our way to the oldest continuously functioning church in the Holy Land which stands over the traditional birthplace of Jesus. Built by Justinian in the 500's, the Church of the Nativity has stood the test of time despite it's weather-beaten appearance. There was an Orthodox mass being held in the cave under the altar of the church. Although we tried to wait it out, in the end we abandoned our attempt to enter the cave, opting instead for the beautiful courtyard of the neighboring Catholic church where we pondered the incomprehensible mystery of the infinite and eternal Creator of the universe emptying himself and entering into creation itself. We sensed God's call to follow Jesus more closely that we too might incarnate the Good News of God's Kingdom for the whole world. After our prayerful time of reflection, we headed for the pastoral hills of the Christian Palestinian village of Beit Sahour, the traditional location for the Shepherd's Fields just outside of Bethlehem. Here, on these rocky hills, Jewish shepherds were spending the night with their flocks under starry skies when all heaven broke out! The lovely chapel at Shepherd's Fields features a dome pierced by hundreds of glass-filled openings, mimicking the glory of an angel filled sky. Holding up the heavy marble altar top are four bronze shepherd boys cowering down in fearful awe of the angel's pronouncement. We sang some familiar Christmas carols in the resonant chapel and then headed for an open-air amphitheater where we gathered to worship while overlooking the Shepherd's Fields. While Art Barrett was teaching us how David's 23rd Psalm reflects the biblical themes of Covenant and Kingdom through the practices of ancient shepherds, as if on divine cue, a shepherd appeared on the hill, moving his flocks to new green pastures! The last, but certainly not least stop for the day, was a visit to Herodium, the amazing conical desert fortress Herod the Great built out of a mountain. Another of Herod's engineering marvels, these massive remains still reflect the audacity of turning a mountain into a palace! It was only six years ago that Herod's tomb was discovered here, buried in the slope of the mountain. We climbed up to the top through naturally air-conditioned tunnels dug by the Zealots who later captured this fort in the Jewish uprising. It was a welcome reprieve from the desert heat! I don't have time to write much, except to say that our spiritual adventure is fully underway now and we are having a great time! We have been starting each morning with a time of reflective Scripture reading and prayer to prepare us for what we will be doing that day. With church bells and the Muslim call to prayer echoing off the walls of the city it is a sublime way to start the day! After visiting Qumran we drove further south along the western shore of the Dead Sea to Masada, Herod the Great's imposing desert fortress. It was here that the Zealots, the Jewish nationalists of Jesus' time, took their final stand against the Romans in AD 73. It was instructive to remember that Jesus chose a radically different path than these violent revolutionaries and his Kingdom goes on forever! Last, but not least, we finished our day with a swim (float!) in the Dead Sea--an experience like none other! Believe me, after floating in water eleven times as saline as the ocean, you need a serious shower!